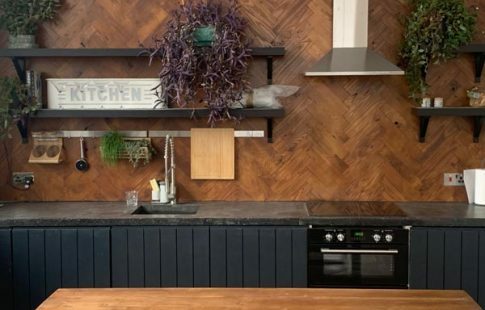 Our kitchen studio has a bespoke design and build, you won’t find another kitchen like it! This rustic space is set up with film and photography in mind with 3 phase power a variety of props, kitchen + dining sets and with a large open area for production on the other side of the kitchen. 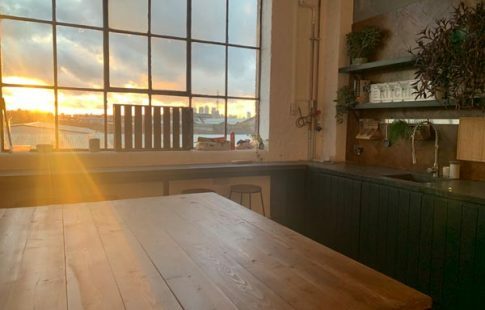 Housed on the corner of the warehouse the kitchen has three huge windows, which let in loads of natural light, perfect for some stunning golden hour photography or filming. However, all three windows do have full blackout blinds as well as rustic curtains to add some diffusion to the sunlight. The kitchen includes a breakfast bar with a view, looking overlooking a London skyline. A bespoke kitchen island with a variety of top-down surfaces for cooking photography or overhead filming.